Note that you always should (need) a delay switching back. If you dont have that you could and will some day end up flickering back and forth when you for instance have an issue. The delay back lets say 60 seconds will save your day and gear! (10-24-2018, 08:25 AM)daromer Wrote: Note that you always should (need) a delay switching back. If you dont have that you could and will some day end up flickering back and forth when you for instance have an issue. The delay back lets say 60 seconds will save your day and gear! I am not sure I follow. Why would it ever flicker back and forth? Also when you say 'back' do you mean back to grid? I should be clear, the plan is to use the watchmon to control the ATS via the 24vdc coils using one of the relays on the expansion board. So the watchmon will flip the grid/inverter power when any cell is below the LBCO. If you have a single source to control the switch it should be fine since batrium have built in delay. The problem is when you introduce a factor without delay or even 2 different factors. Only problem with the batrium is if it fails and doesnt stay stable on one lane. Lets hope that doesnt happen though I only run trip shunt on my batrium so it doesnt controll anything back and forth right now. If you switch between battery and grid and you have priority grid but the grid is malfunction so it switches back to grid but directly grid fails and switches back to battery.. For instance when there is a short on the grid where i live the grid generally can flicker 3 times in a row within seconds. This is not much but still its something that can destroy gear! If you live anywhere near where there are trees near the lines, you can have fluctuations that cause a rapid switching back and forth between your power inputs. If the normal switching delay is 20ms, then it's possible you could get 10 switches back and forth with a second. That's a lot of extra wear and tear on the contacts/switches. By using the delay back to grid, you can greatly increase your chances of a successful switch over without disturbing your electrical devices. If you ever take a UPS and trigger it to battery, then reconnect the AC power, you'll notice it takes it a few seconds to switch back to grid. Even the cheap units do this. Not only is this to protect your equipment, but also the battery and the electronics in the UPS itself. Each time a trigger event occurs, that's a huge hit on the electronics to work to get things to switch over. It's not like 2 railroads merging into 1 and you just switch from one to the other. Thanks guys, I appreciate you spending the time to chat about these things. However, I think I am still missing something. Maybe ATS is the wrong definition for what I am doing. Basically, I will run on battery as long as I can, until I hit LBCO on any one cell. Then the batrium will flip the contactors to grid via a relay. The contactors I have have 24vdc coils, so it won't be an electrical-mechanical ATS like the one in daromer's videos. There will be no monitoring on the grid, so if the grid is in a poor state, well then that's what I get. The batrium will not flip the contactors to battery again until all cells are at least nominal voltage (or some acceptable level). So I can't see a chance for a flicker here. Am I still missing something? Sorry if I am being dense. As i said your setup is not generally prone to issues no. Its ok but beware of that you need a dual system where you disable on 1 and enable on one. You are generally not allowed to just via 1 relay switch source of power. Yea I will being using 2 contactors with a mechanical interlock. 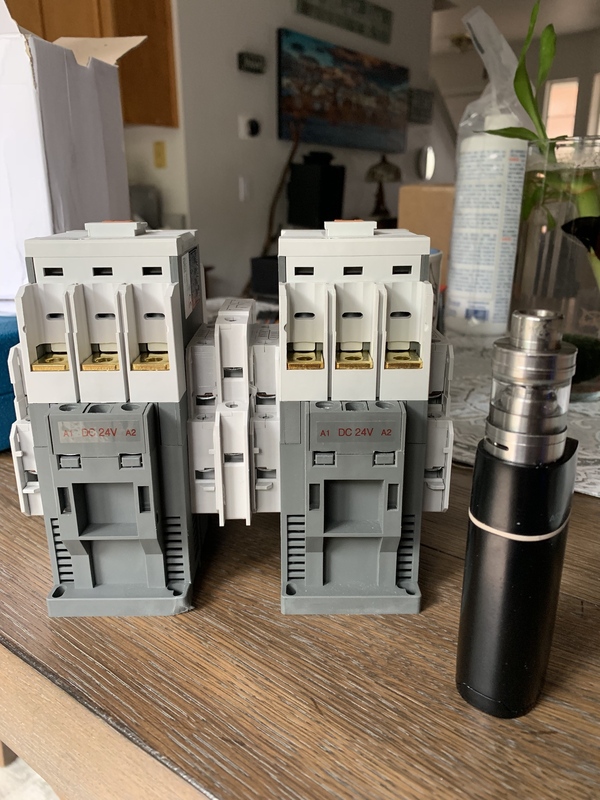 I will being using one relay from the watchmon to control the inverter contactor and the grid contactor will be controlled by the NO/NC terminals from he inverter contactor. This way there is only one control for both contactors and they will always be opposite. BTW, 100A 3-pole contactors are huge.